Click on a topic to find links to the recommended websites for this book. 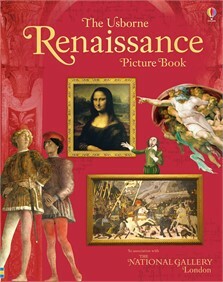 A fascinating introduction to the Renaissance, featuring Renaissance fashion, artists such as Botticelli, Michelangelo and Leonardo da Vinci, information about how people lived and worked and the famous scientific discoveries of the age. With contents and index pages for easy reference and internet links to selected websites to find out more. When she wasn’t out riding her bike or making things out of loo rolls and scraps of fabric, Ruth Brocklehurst spent much of her childhood reading – especially historical novels and whodunits. Since joining Usborne in 2000, she has written and edited countless books on everything from craft activities and history, to creative writing, space exploration and dinosaurs. If she could go back in time she’d like to meet Mary Queen of Scots.